Did you know that the lyrics to "Crank Dat Soulja Boy" are too crude to print in this column, because it will look bad when future employers and future boyfriends Google my name? Thanks Soulja Boy. Love, Me. While I cannot claim to be one of the enigmatic "Daughters of Dartmouth," I am a daughter of Dartmouth, a female undergraduate, as are half the students on this campus. How many of the daughters of Dartmouth like the Soulja Boy song? Plenty. And, when we hear the beat and that irresistible steel drum, how many of us actually consider the obscene lyrics of this fall's YouTube phenomenon? The relationship between rap music and sexism has been discussed in these pages before; a few of my fellow columnists and I have agreed that we do not internalize the messages of the rap artists we like. The Soulja Boy dance is an 07F tradition. Whether we learned it from H-Croo during DOC Trips or from YouTube, the vast majority of us just dance because it's fun. We are all too busy busting our moves at spontaneous dance parties to consider the sexist implications of the song, and there is nothing wrong with that, because we are genuinely enjoying ourselves. I recently saw a video clip of a kids' ballet class performing the dance, which reaffirms the idea that dancing is usually unrelated to supporting the crass objectification of women. To apply this idea to more serious issues, before we denounce a statement or action as offensive, we need to consider the motivations of the offending person. I am certainly not defending Soulja Boy, but I think it is safe to say that most DJs play the song because it is popular, not because they endorse its message. While it is impossible to know in many cases whether an offensive comment is rooted in a deeper problem such as sexism or whether it is just a harmless joke taken out of context, it is necessary to think about it and discuss it before branding it as sexism. Discussion in any form on any issue is a positive thing. The Daughters of Dartmouth signs certainly provoked campus-wide discussions, their tones ranging from agreement to anger. But even though a few of the signs address issues that I, a female student, find troubling, I did not feel that posting them did anything except antagonize various campus groups. Discussion amongst individuals about problems that exist between them is a far more effective way to address those problems. If I were a member of the male athletic team indirectly accused of misogyny, I would be frustrated by the fact that a faceless group of women labels me by my athletic association, and I would probably just get angry that they were judging me without allowing me to explain myself. 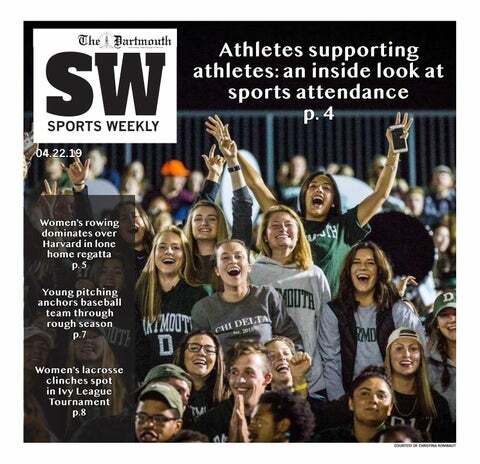 That being said, I am not trying to say there is not tension between men and women at Dartmouth. The Chi Gam T-shirts and the idea of a group of male athletes singing "Men of Dartmouth" as a tradition both nauseate me, regardless of either organization's intentions. But in order to change those things that make women or any group on campus feel uncomfortable, it is necessary to treat such instances directly, with face-to-face discussions where both sides can respectfully express an opinion. The same way the women of Dartmouth are not a homogeneous group, individual members of that male team think and act for themselves. Their organization is founded on a common interest and skill, not a moral or political belief. It seems to me that posting signs does nothing to diminish tension; instead, it just exacerbates the boys versus girls atmosphere upon which that tension thrives. By making blanket associations that equate male athletes with misogyny is unfair and ends up alienating the men who maybe would have been working against sexism in their various organizations. It also paints any woman who continues to associate with those men as a hypocrite and a traitor. Let's not be hypocrites, but let's be strong women who demand to hear everyone's point of view and who hold our male (and female) counterparts accountable to defend their words and actions to the community. See you on the dance floor.